Today I am joining a bunch of fun and talented bloggers for the first ever Craft Destash Challenge! 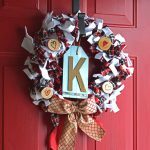 For the challenge, each blogger can use craft items already in her stash of craft supplies. We can remake something or put together sometime new with craft supplies already on hand. 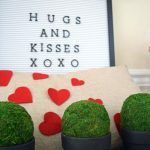 I decided to style my new galvanized tin tiered tray for Valentine’s Day. Tiered trays are a lot of fun to decorate. What I love about them is that it’s easy to make them look good, and it doesn’t take a lot of time or money to decorate them, either! My project is actually more of a decor project than a craft project, but I did use items in my craft stash. I’ve added some heart cookie cutters that I’ve used for tracing out paper and fabric hearts. I also put to use a swatch of cute buffalo plaid fabric that I used in another project. Finally, I added some faux greenery from my craft stash that I’ve had for a while. I’ve been following the tiered tray trend for a while now. Most tiered trays consist of 2-3 stacked above each other. I love how this one simple item can be styled in so many different ways! 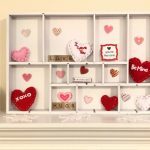 A tiered tray can be decorated by season/holiday (e.g., winter and Valentine’s Day) or by room. 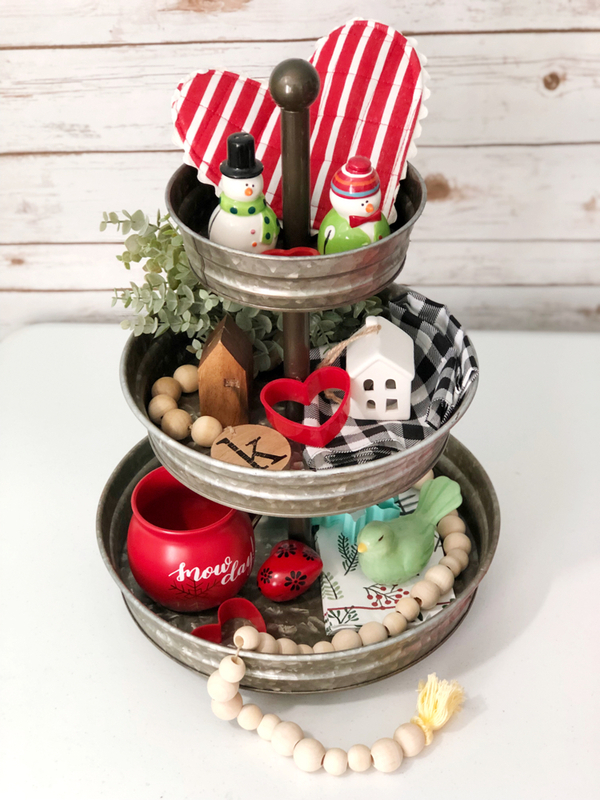 My galvanized tin three-tiered tray — with its snowman salt and pepper shakers, “Snow Day” mug, napkins, heart potholder and cookie cutters, is a perfect fit for my kitchen’s farmhouse-style table. I also like that a tiered tray can add fun holiday flair to any room without much effort or money! Some of the items I used on my tray have been gifted to me. (Carrie of Curly Crafty Mom gave me the beaded garlands and the potholder.) I got some of the other items at my local craft store for only a few dollars total. I also use several items that I already had on hand in my house for my tiered tray. To create visual interest on a tiered tray, it helps to vary the type of materials you use. For example, I used fabric, wood, metal, plastic and ceramics. Part of the fun of putting a tiered tray together is mixing and matching different items. Using items of different heights on a tiered tray helps add extra dimension. It’s also nice to use taller items on the top tier for more visual interest. It helps to use one color multiple times in a tiered tray display to tie all the levels together. 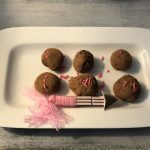 I used red for Valentine’s Day – it will be fun to change the color scheme throughout the seasons. Part of what’s so gratifying about decorating a tiered tray is using items that speak to you. 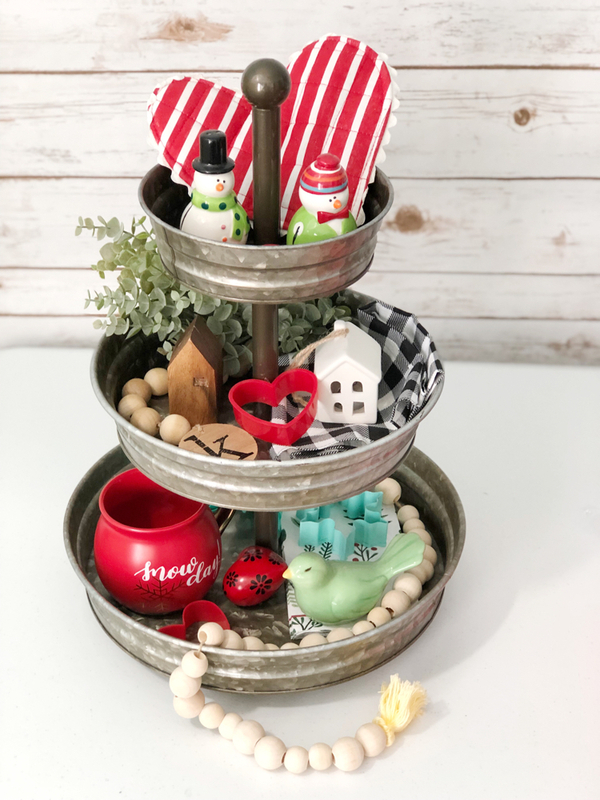 I adore miniatures, so for me, styling a tiered tray is a fun way to use some of my favorite miniature items. This time I added my salt and pepper shakers, the mini houses, and the ceramic bird that I once painted. It’s also fun to use sentimental items like my beaded garlands from my blogging friend, Carrie. 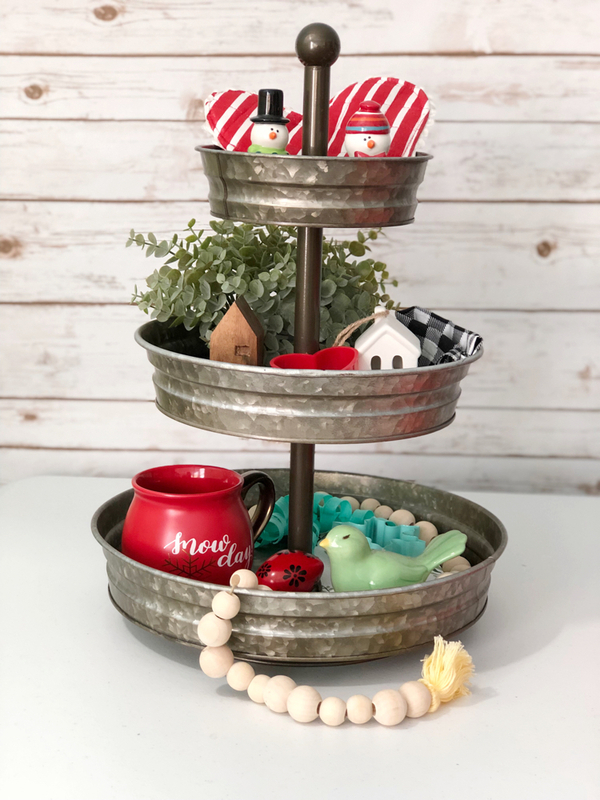 If you would like to get a farmhouse-style tiered tray, there are lots of options on Amazon. The above is the galvanized tin three-tiered tray that I got from Amazon. I have Amazon Prime, so I get free shipping on everything I order from Amazon, and I can usually get my items in two days. It really comes in handy when I am trying to complete a project on time. I hope you enjoyed my Valentine’s Day themed tiered tray! 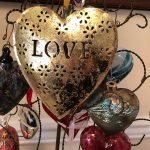 Be sure to check out my blogging friends’ Craft Destash projects! 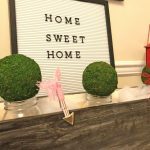 This post was shared at the HomeStyle Gathering linky party.